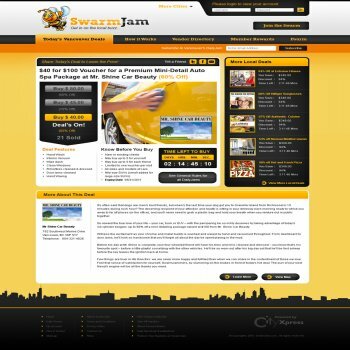 SwarmJam is a project of CityXpress Ltd, an internet software development firm. 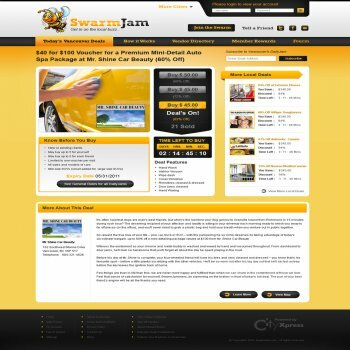 SwarmJam connects advertisers with consumers to offer daily deals – popular products at significant discounts. 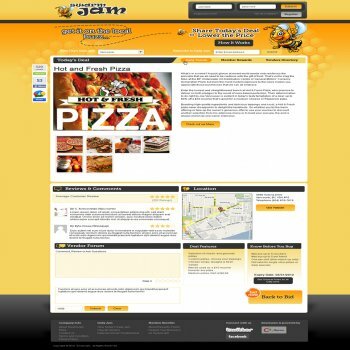 SwarmJam is live in Vancouver, Canada. 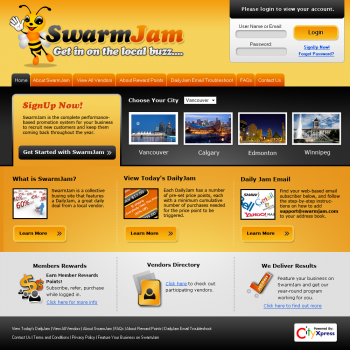 SwarmJam is targeted at online consumers in selected Canadian Cities. 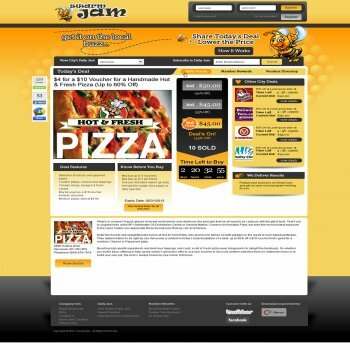 Our websites new skin will need a maximum of 10 pages designed. When you view our site you will notice that approximately 5 of these are simple text pages. Once we have chosen a winner they must have all their designs with multiple edits submitted and completed within a week. We are on a sharp deadline to have this website completed and will work with the wining designer to make the project wrap up quick. 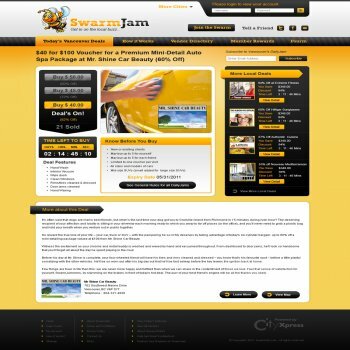 SwarmJam is a new concept in group purchasing utilizing social networking. Tying “Swarm” and “Jam” together creates an image of a large dynamic group. • The mascot is a happy, eager and excited bee. • His hand is raised in attention, ready to spread the word and share great deals and promotions with his hive. • His tail is buzzing with movement and action. • The brand is energetic, playful and urgent. • local – deals are local. Customers see great offerings in their own area. “Local deals” are crucial to the effectiveness and success of the program. • buzz – it’s all about spreading the word and group numbers. The more that get in on it, the better for everyone (customers and merchants). The overall theme drives from the bee – working in numbers, buzzing with relentless energy and producing! • “Swarm” – the act of getting together as a group. • “Join the Swarm” – a call to join the group and get the best pricing. 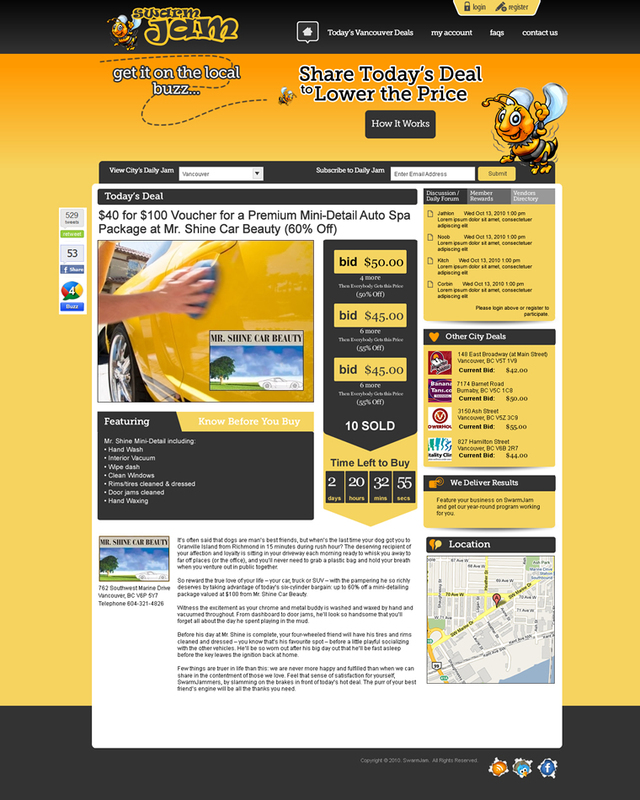 • “Creating a buzz for your business” – articulates the benefit a merchant receives. • The main brand colours are driven from bee iconography: yellow, black and white. Bold and attention grabbing, fun! In other words, we’re looking for a redesign that incorporates the above ideas, in a somewhat yellow-ish colour scheme, with a modern web 2.0 look. The pages we want designed are the Vancouver home page, showing the daily deal and related information and user account pages. We’ll apply the design to other pages within the site (since it’s a dynamic application, rather than a static website). Ultimately, we’ll want HTML and CSS from a designer. Want a unique web page design like this one? 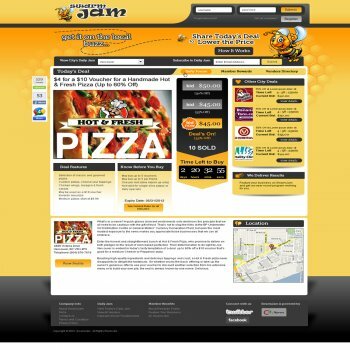 Get Your Perfect Web Page Now!